So we have seen from the previous comparing the raw polygon accuracy between Voronoi generated polygons and NRS generated postcode polygons: Results. The physical results are interesting, and a visual examination can provide a useful overall comparison, but how does this actually impact me? I have a CAG from GCC and I just want to attach a postcode to it. 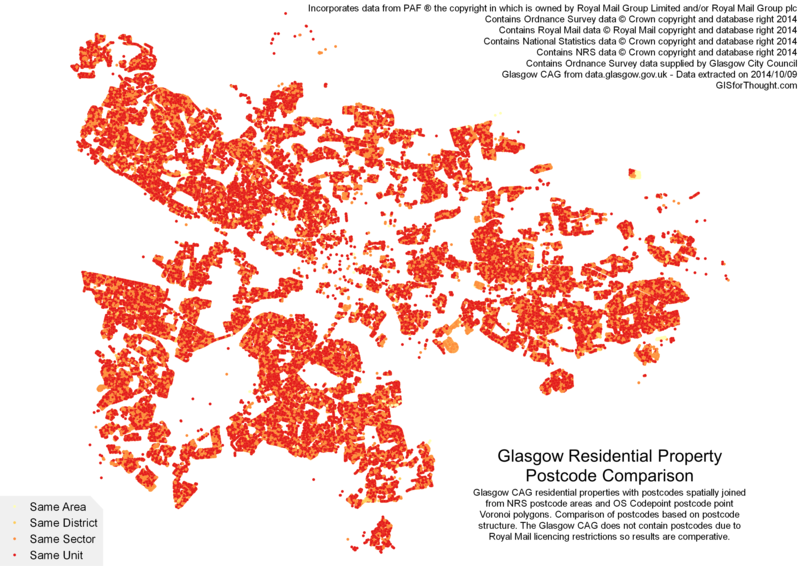 How different will my results be between a true postcode boundary dataset from the NRS, and a generated Voronoi dataset from the OS? Lets take a postcode of G31 2XT how does it break down? This entry was posted in All, Data, Mapvember, Open Data, Scotland on 11/20/2014 by Heikki Vesanto. Great analysis. Super interesting. But how does the OS Codepoint Open team determine the location of their postcode unit points? Each of those initial point placements is critical in Voronoi polygon construction. I believe they are the polygon centroids from the OS Codepoint Polygon dataset, which contain “actual” postcode areas. I’m planning on generating postcode sector and district boundaries from Code-point Open. Have you written more about your approach to this process? I’ve been experimenting generating voronoi boundaries from the individual postcode unit locations, however they are rounded edged and am not sure how well they will translate to the often complex district and sector boundaries. Any thoughts or suggestions would be appreciated, we are unable to afford the licensing costs of Code-point with Polygons.